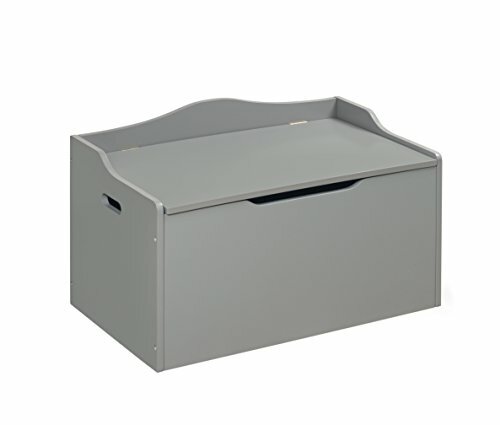 Badger Basket's sturdy Bench Top Toy Box in Gray is an attractive and functional storage solution for toys, linens, shoes, hats and mittens, and more. Blends well in any room of the home, such as kid's rooms, foyers, guest rooms, and summer homes. Bench top design is great for kids as a reading bench or a place to perch when dressing or putting on shoes. Scalloped top rails keep items from falling off the back or sides. Quality hardware with two safety support hinges. Little fingers are safe from slamming lids thanks to the two safety hinges that hold the lid in the open position. Side handles make it easy to move around when cleaning or rearranging furniture. Handle slot on front makes it comfortable and convenient to open the lid, and prevents fingers from being pinched when closing the lid. Smooth surfaces are easy to clean and maintain. Made with engineered wood. Gray painted finish. Metal hardware. Overall measurements 30.25 inches Long x 18 inches Deep x 19 inches High. Measures 14.5 inches to top edge of box, 15.125 inches to top of lid/seat, 17.375 inches to highest point on the side panels. Interior space dimensions: 29 inches Long x 16.75 inches Deep x 13.75 inches High. Assembled weight: 36 pounds. All measurements approximate. Wipe clean with a lightly dampened cloth and mild detergent as needed and dry thoroughly. Adult assembly required. Illustrated assembly instructions included. Non-toxic painted finish. Product complies with all currently applicable safety standards and CARB ATCM standards. Bench can support up to 175 pounds. Product includes a limited warranty of 30 Days Parts to the original purchaser. Product may vary slightly from shown and described. Props/accessories shown are for illustration purposes only and are not included with the product. Actual color/finish may vary slightly from screen display. This item ships in its original carton which may include a product photo.